Why is a Perfect Pitch unique ? A new performance from a deep tradition. KEEPING THE FIRE GOING . . .
Presenting a successful street performance is similar to lighting a camp fire. The artist must begin by lighting a match, in performing terms attracting the audience and creating the ambience for the street to turn into the theater. Once more people arrive, the timber catches, and the artist is able to present the main part of the show, putting on as large a piece of wood as they desire. When done properly the finale of the street performance is similar to the explosion of fireworks, and what began as a very normal piece of street is now filled with a warm positive glow that slowly disappears as both the audience and the artist vanish into the streets. The Perfect Pitch is able to hold this warmth and keep the communal camp fire going for hours on end. As one performance finishes the Presenter can bring the flames back to their glowing coals, so that the following performer can easily re-light the magical fire again. WHAT IS THE PERFECT PITCH ? The Perfect Pitch is an evening filling, non-stop, ever-changing comedy and entertainment experience specifically designed for open air public spaces. The Perfect Pitch links together the skills and variety of top international performers, using a Presenter to keep the positive energy going, and insure there is never a dull moment. The entertainment value of the whole show is larger than the sum of it's parts! During The Perfect Pitch, the audience is free to come and go as they please. This creates the combination of eager new people arriving and enthusiastic fans waiting for more. Playing for 3 - 8 hours a day, people can choose the length of the show themselves. And spread out over a few days, people will come back for bits and pieces, bringing friends with them, and The Perfect Pitch really takes off. The core entertainment during The Perfect Pitch are experienced street performers, who for years have been playing on major festivals and stages throughout the world. Each Perfect Pitch is a select mix from all disciplines of street theater (clowns, acrobats, jugglers, musicians, puppets, dance, mime, etc.) The key that binds the acts together is their creative and professional use of the space and interaction with the audience. The secret to the success of the show is the proper orchestration of the acts to create the best atmosphere. The Perfect Pitch can happen in any open public area where there is enough space for people to gather. The infrastructure is relatively simple: A low stage for the performers, a basic light and sound system to fit the space, and some seating for the audience. The Perfect Pitch is best played when at least half the audience can be seated to enjoy a number of the acts. This can be in a natural amphitheatre, in front of steps, or on raised seating. WHAT MAKES THE PERFECT PITCH UNIQUE ? A vast network of experienced street performers who continually recommend new talent to the project, and the organisational experience to insure all the pieces come together to produce an entertaining evening. This combination makes it easy for any public festival or event to feature some of the world's best street entertainment without chasing artists and agencies around the world. It also provides the security of knowing that all the details are professionally arranged, and the show will go on . . . and on . . . . and on. . .
. . . to the audience's delight! Lee has been travelling the world for 15 years performing side by side with the best open-air performers. This has given him the experience to know what an audience and an artist need to create a special atmosphere and enjoyable evening. As a colleague, this creates an extensive network of talented acts that can be part of The Perfect Pitch. In addition this has given Lee the opportunity to see the benefits and faults of many attempts at producing street theater. For the past 5 years, Lee has been the Presenter in a similar show to the Perfect Pitch: EL PATI FREE which has been presented over 50 times around Spain and internationally. In this function, he has learnt how to adapt the program, the artists and the audience to make the show a success in any location. The first event Lee organised (The 12th European Juggling Convention in Maastricht NL, 1989) was such a success, that Lee quickly became involved in the EJA (European Juggling Association) In 1990 he became vice-president and since 1993 he has been President of the organisation. In this time, he has organised or advised more than 20 international festivals around the world. The yearly European Juggling Convention has grown to become the largest gathering of jugglers in the world. In 1993 Lee became programmer of the Oranjeboom Straatfestival in Rotterdam. For the next 5 years he established his reputation as a successful organiser who understands what the artists and audiences desires. While he was involved, the festival became known through out Europe for presenting new and undiscovered talent. 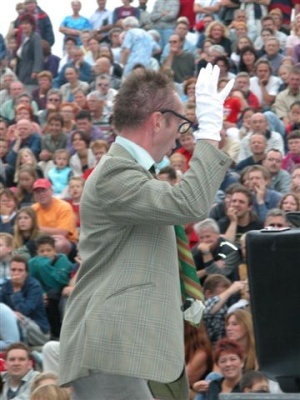 After resigning from the Oranjeboom Straatfestival, Lee has been adviser or programmer to more than 10 other street theater events in Benelux, and Germany. Lee has also been an advisor to Free Art Agency in Barcelona, and has introduced many acts that have contributed to the success of EL PATI FREE.